Surely everyone secretly wants an orange monitor for their desk? We're not going to be harsh on Acer for wrapping this 24-incher in a sparkly orange costume. It's a slightly adolescent look. But at least it has pizzazz. As does the bold image quality this screen cranks out. The use of a glossy screen coating delivers razor sharp clarity and superior colour saturation and contrast than the matte-surfaced competition. Still, Acer's claims of 50,000:1 contrast are truly laughable and are best ignored. Other plus points are bright and even whites, a strong backlight, excellent pixel response and a total absence of lag. Granted, compared to PVA panels, the black levels are poor. 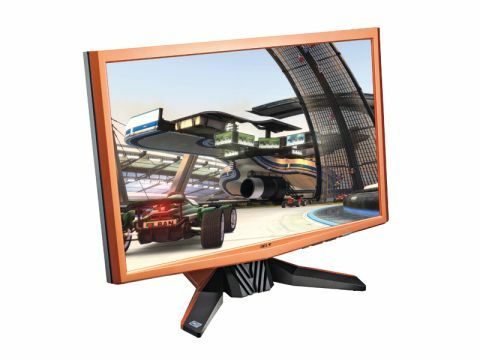 But this really is a great gaming monitor.